Departures: Only upon request, mid-May to mid-October from Advocate Harbour. As this tour is very tide-dependent, the start times vary widely from day to day, and can be anything from early morning to late afternoon.  Minimum number of participants is 4. Duration: 3 hrs door to door from our office in Advocate (incl. approx. 20 min driving time in your own vehicle each way to and from the launch spot, instructions on the beach, and a small picnic afterwards on the beach). You do not have to return to our office after the tour. Paddling time: About 1 hr (2 km, 1 mi) in stable yet sporty double sea kayaks. Who is this for? 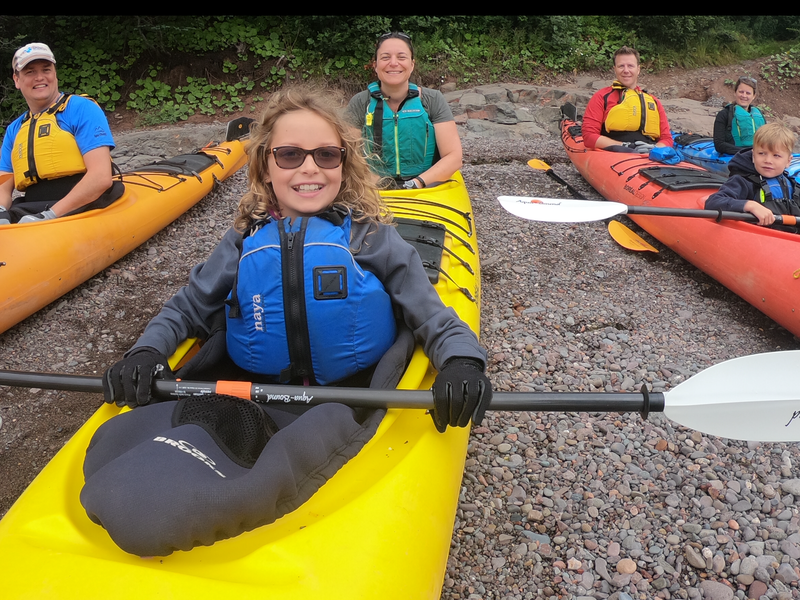 This experience is geared towards families with young children and anyone who is looking for a very brief paddle on the beautiful Bay of Fundy. 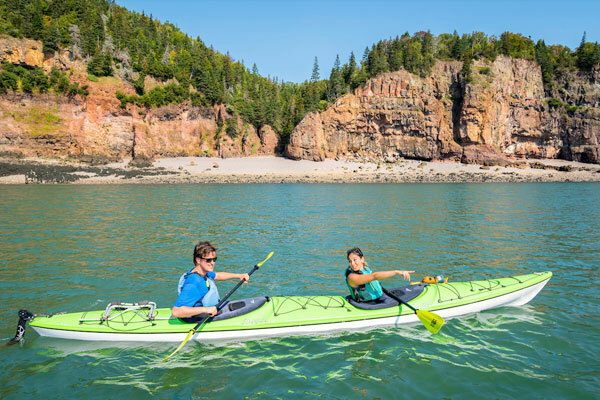 If you are looking to see Fundy highlights such as sea stacks and other amazing rock formations, please consider taking the Three Sisters Day Tour (3 hrs of paddling broken up with a relaxing picnic on a beach). 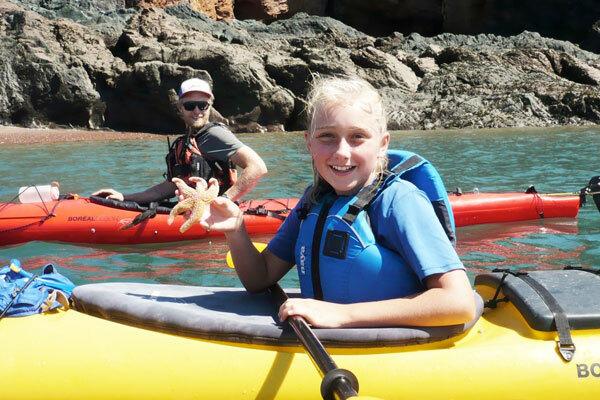 Explore the serene Fundy cliffs – with the whole family! Horseshoe Cove is a secluded Cove located on Cape d’Or, a 20-min drive from our office in Advocate Harbour. Its location shelters it from the summer winds that can make the waters choppy on our more exposed day tour. 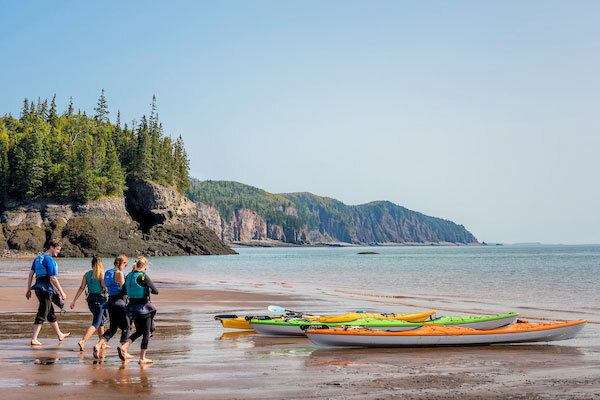 Highlights include paddling through an arch at high tide, viewing the stunning Fundy cliffs, and enjoying the serenity of this remote part of the world that sometimes blesses us with an eagle in flight or a seal. We stay mainly in the Cove, but if conditions allow – and paddlers are up for it – we can peek around the corner and see the operating Lighthouse on Cape d’Or from the water. At the other end of the cove, if we paddle a bit further, we can see the entrance to a mine shaft high up in the Fundy cliffs. Copper was mined here for a brief period around 1900. Earlier, in 1604, French explorer Samuel Champlain mistook the glare in the cliffs at sunset for Gold and named them Cap d’Or – the Cape of Gold. The cliffs themselves date back to the early Jurassic, when dinosaurs roamed the area and the earth surface opened like a giant zipper to spill lava onto its surface – the biggest spill in earth history, running all along the Fundy shore. Today, beachcombers come here to look for agate, and you can do the same after we serve some refreshments on the beach. A light refreshment is included. Beginners welcome! A certain level of fitness is required. You do not need to know how to swim. Check-in & drive: After checking in at our office in Advocate Harbour (1 hr 20 min from Amherst, 40 min from Parrsboro, 3 hrs from Halifax, 2 hrs from Truro), you drive ca. 20 min in your own car to the launch spot at Cape d’Or where the guides will be waiting for you. Half of the drive is on gravel, which is suitable for all types of vehicles incl. RVs.